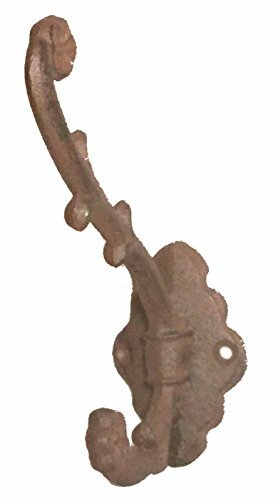 Durable rustic iron hooks will blend in handsomely with any décor. Use them inside or out. Perfect for towels, scarves, robe or coat. Alternatively, if used outdoor, can serve to hold your favorite plant. Large hook width provides options to hang larger items. Sold in sets of 3. Measures approx. 7" long by 3 3/4 " wide. Large 2 1/2' hook width. Large hook width provides options to hang large items. If you have any questions about this product by Rustic, contact us by completing and submitting the form below. If you are looking for a specif part number, please include it with your message.